Since taking it over they have extended the building whilst keeping the heritage alive. 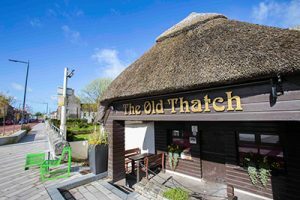 The Restaurant is now thriving and Head Chef and Part owner Debbie Walsh with over 25 years’ experience 10 of those years here in The Old Thatch brings with her a complete dedication to Irish produce to create her own ideas. Along with our regular favourites the menu also offers specialities we are sure you’ll enjoy We try to create a relaxed dining experience. Whether you are dining in our main restaurant or looking to experience the craic and banter amongst our locals in the bar we hope you’ll enjoy the unique setting and perfect ambience with us here. Our Local and Friendly staff will do everything to make your dining experience a rememberable one and if you have any questions or require any help throughout your visit please do not hesitate to ask one of them. The restaurant is open for à la carte from 3:30pm-9pm Monday to Saturday, and to 8pm on Sunday.